As I'm journeying through Yorkshire, i can't help reflecting on the three years I spent (or misspent) here as a student. I'm a little bit sad to say that i don't think there's a single trace of Yorkshire lass about me. Even down to the way I make a cup of tea - I like it weak, like dishwater - I'm definitely a soft southerner through and through. Tea, you see, is pivotal to Yorkshire life. 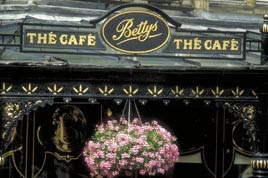 And Bettys, Yorkshire's most famous teashop - is nothing short of a national institution. Bettys was founded in 1919 by Swiss confectioner Frederick Belmont, who, on arrival in London was planning to head to the popular southern seaside resorts to establish his business but took the wrong train and ended up in Yorkshire. His inital dismay was quickly replaced with a love for the beautiful Yorkshire countryside which reminded him of his alpine home. In spite of the fact that I am a tea and cake fanatic, an almost 90 year old tea shop patronised by what I imagine to be coachloads of the blue-rinse brigade doesn't overwhelmingly appeal. I like to think my taste is little more 'bijou' so I feel sure I'll be disappointed. But I'm pleased to report it's actually a not-to-be-missed experience: the height of elegance and gentility and the rainbow-coloured spectrum of cakes and tarts is a dazzling sight to behold. And little wonder its packed full with tourists eager to immerse themselves in the quintessentially English pursuit of taking afternoon tea. I have a friend who had a Saturday job at Bettys when he was young (beats working in McDonalds!) and his top tip for my visit was to try a warm buttered Fat Rascal - a Bettys part scone, part rock cake speciality (pictured on display in the window below). I duly indulged and can confirm that they are freshly baked, crumbly perfection - the melted butter part is a must. There are now six Bettys tearooms - all in Yorkshire. 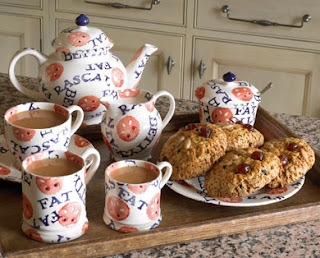 And they also have a mouthwatering mail order website from which I pinched this beautiful picture of a plate of Fat Rascals with Emma Bridgewater's adorable bespoke Bettys pottery - all of which can be ordered here online. I've eaten a Fat Rascal and it was delicious! I recommend eating them warm, with a generous portion of butter - yum.